For your second point I would like to refer you to the thread started by StormCommando, below. I can’t remember where answers are for the first, but I do remember carrying capacity being discussed on one of the threads. You may classify it however you like. 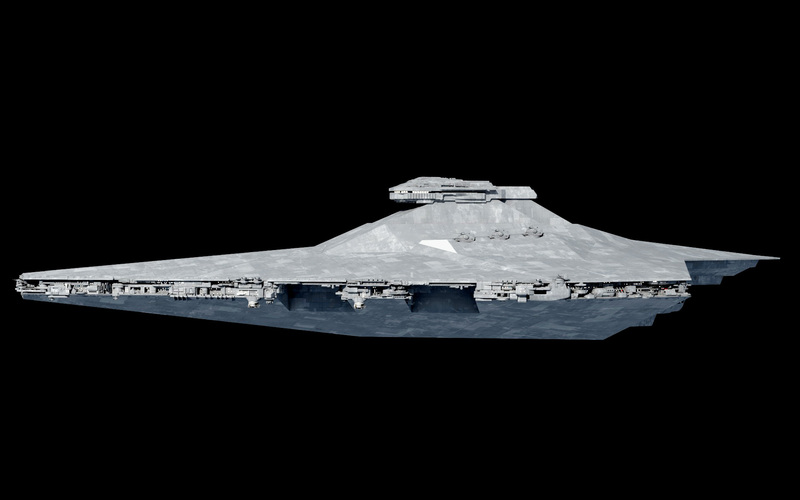 I write game stats for a D6 forum, and if I end up really liking the finished product, I’ll likely end up classifying this ship as a Heavy Cruiser or Light Star Destroyer on that stat. That doesn’t require fractalsponge to alter his classification system to fit mine, and the fandom is more than big enough for both perspectives to exist with room to spare. On top of that, the Anaxes System is crap. To quote a guy on the D6 forum (who is also a History Professor), the Anaxes System has little military value beyond impressing politicians and uninformed civilians. Form follows function, and size is a subset of form. A system that classifies vessels purely by size fails to take into account the far more important classification of mission. Hey, fractalsponge, I’ve noticed that your ship classification system doesn’t adhere to the Anaxes system. Why is that, and can you explain the system you do use and the reasoning behind it? Yeah I’m new here and too naive so thanks a lot for the suggestion. Fantastic, have been looking forward to this since the first preview! It’s an instant favourite. The protruding hunchback bridge, the hull’s low angle, and broad sweeping wedge-shape gives it a real elegance. Going by the bridge I am guessing it’s between 750 and 850 metres long. Reactor draw… 2e24w? You probably missed it in the giant HSF tangent – the ship is ~880m right now. Not entirely final, but ~1.5e24W is a fair estimate. Nice, thanks. If it’s missing the huge carrying capacity of the Acclamator, but uses roughly the same chassis, only enlarged, it must have room for more reactors where those big hangar bays are? Perhaps two ‘engine reactors’ which can also contribute to main power generation and channel that energy to weapons and shields if needed. EU has Mon Cal equipping their ships with three times as many shield generators as Imperial ships do. This mean more redundancy, more shield strength, and high shield recharge. Mon Cal ship could have one shield generator be active while the other two stand by. Then take the first offline to recharge and bring the second online. Repeat for third. This would be one way how they do it. The High Seas Fleet was a braindead notion, full stop. And now I have officially reached the limit of effort I’m willing to expend on responding to this. Nice exchange but I am calling time. This is a comment section for a fan interpretation of a hypothetical reconfiguration of a fictional spaceship. What the hell do you expect? I find myself headscratching WRT the shield-redundancy approach’s effectiveness in pitched exchanges with a peer-or-heavier opponent. Seems like energy-weapon speed would have a nasty chance of exploiting that generator-swap window, and what happens if bleedthrough happens to cook one or more of your shield *projectors*? Might give MCs a bit more breathing room in long-range duels or forming up for lightspeed retreats, *or* keep big carrier craft alive long enough for the latter, but I dunno about extra generators constituting a decisive or disproportionate slugging-match advantage. Workable redundancy does seem well & good for raid-and-retreat ops, though cruiser-tonnage designs like Home One strike me as more battle-line oriented. I just have issues when it’s brainbugged to the point where peeps are claiming a Venator-sized MC (or one of the NR destroyer designs) can casually tank the attentions of something like Executor. 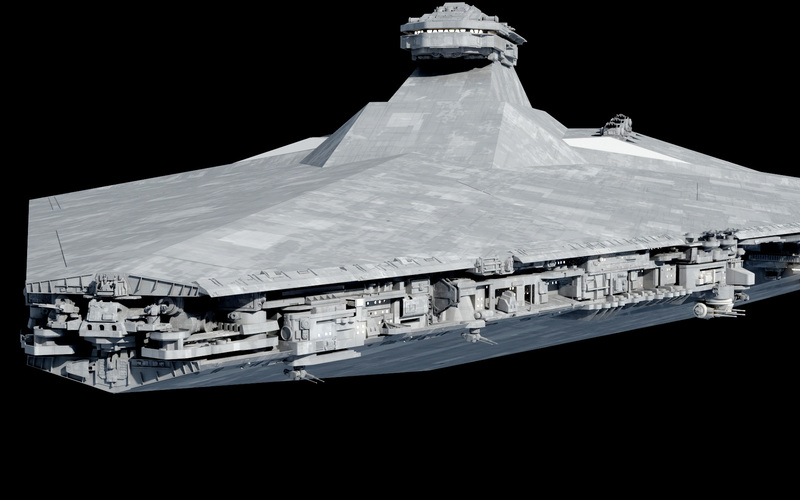 Seems more prudent to retcon the size & hence power output of such Hero Ships(C) than claim ‘magic super-shields, yo’. Nope Fractal said this ship is a fleet variant as in a warship while the Acclamator was a assault ship which mostly carried ground vehicles. 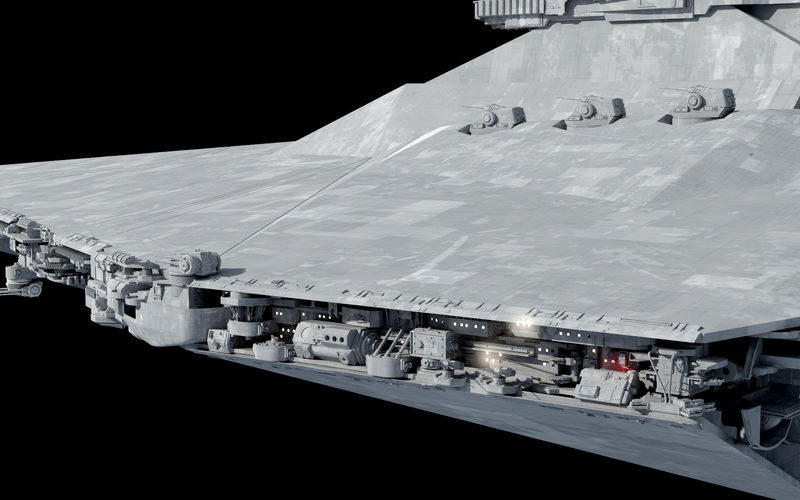 Well, it does look like an Acclamator plundered its bank account to buy beefed up armor and more weapons for itself, although the bridge looks more Venator-esque to me. What’s this baby gonna be called? 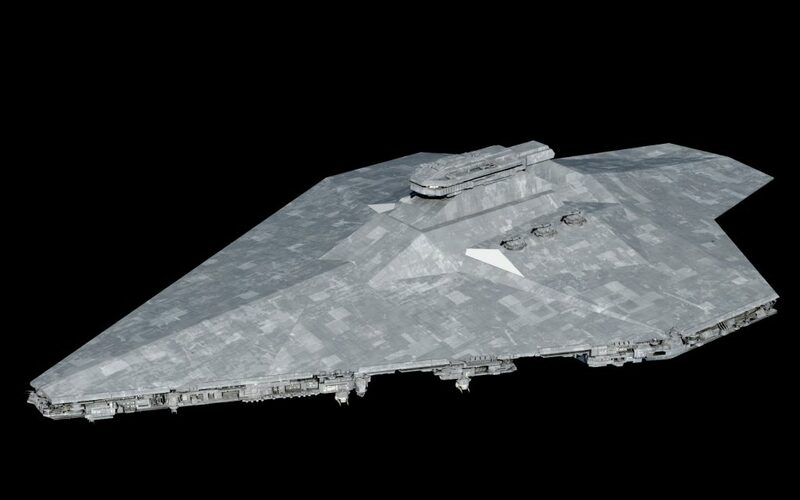 Adiutor-class Star Frigate? Adiutor means literally “helper” or “Assistant” in latin and would be in line with the usual Republic name theme. Acclamator for fleet combat? Sounds like an Acclamator II-class to me. 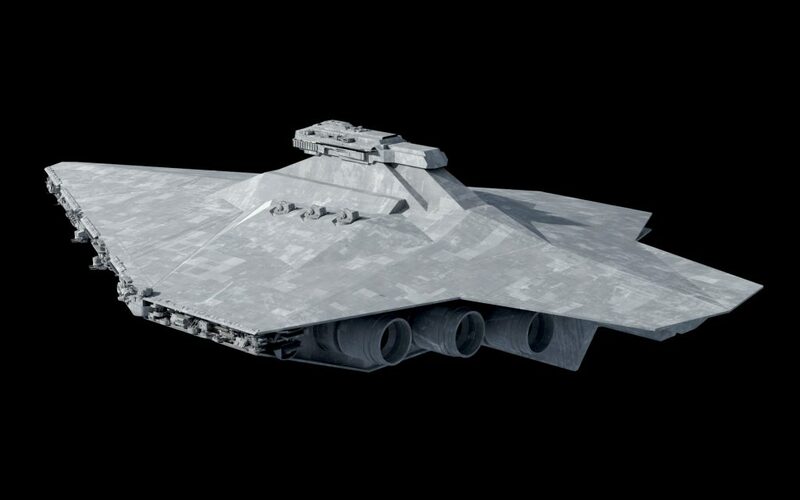 Though given the armaments and thrusters I see, And I’d like to designate it a rapid response cruiser. Is it still around 700m long ? Well last time I check the Acclamator is 752 meters in length so this might be the same length. Yeah, but we all know the Empire has a strong tendancy to do everything bigger. 880m, mostly because of the fantail extension. The core hull largely follows Acclamator dimensions; the idea is that the Acclamator was a razee version of this design. If we take the absurd hyperdrive speed numbers at face value for the Acclamator, a razee refit would explain its speed pretty convincingly. I have an Acclamator model right next to it, and I work in direct scale, so it is 880m right now. Can we see your Acclamator model? Speaking of stripdowns, cornball vs-debate query: how many ‘Assault Frigate’ Dreadnaught conversions would you need to make this thing break a sweat? I’m guessing 4-5, but that might be yet another lowball. So given prior discussion WRT the number of Dreads you’d need to actually dent an Impstar, this frigate boasts enough juice to potentially slug it out with at least two, and may well have a hefty edge in the thrust department. Granted, we have three very different ‘assault frigate’ designs to consider, but none of ’em strike me as especially nimble (and only one seems to add much potential reactor space). Seconded WRT those triples (70 teraton? ), though Fractal’s snazzy ball turrets take the top spot for me. I take it said trips are the heaviest energy weapon this Acc-gunboat has the juice to efficiently wield? They seem like they might be the same guns as the axial battery on the ISD. Triples just look great in general, whether they’re on the Rodney, Iowa, or Imperator. 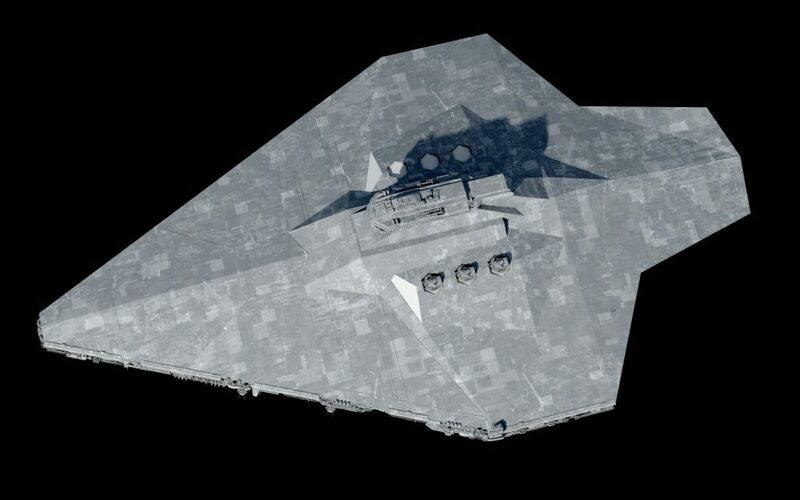 Current version is the same as the axial triple turrets on ISD, so 32-40 teraton range. Well, better firing arcs seem to entail a great deal of ‘exposure’ as in ‘more open space that your turrets can traverse’. Seems to me you’d usually want to optimize offensive capability so targets jump out or get vaped before they can pound your ship to the point where losing main guns (or other crucial components) is on the table. Hey fractal, what program do you use to make your models? 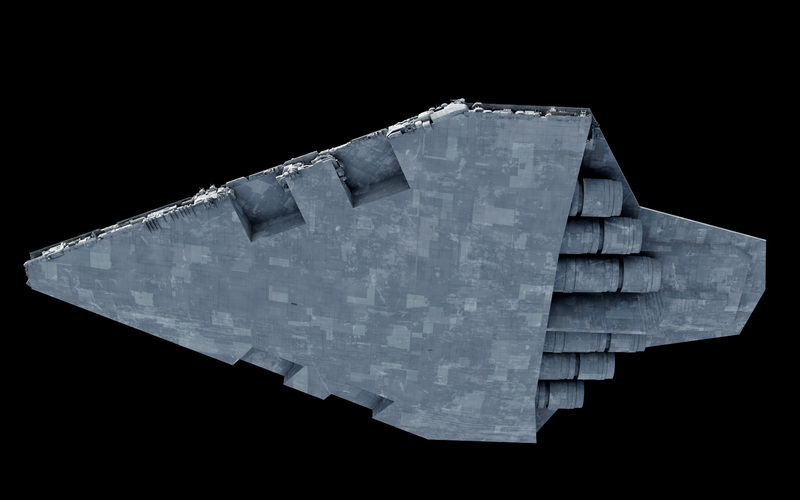 I think you are an awesome designer, and modeler, I would love to see your take on the TOR Thanatos Frigate aka updated Hammerhead…. I have been hoping you would work on this and glad to see it, love the shape of the acclamator and it really can pack some firepower in a small package. What are the big cutouts? Ah, a fresh mental picture of the Comarre Meridian. This fills a much needed spot in the ORBAT, with an interesting hangar configuration. Excellent. IT LIVES!!!! I’ve been hoping you’d get back to this one! Would it be possible to suggest a name for this things? 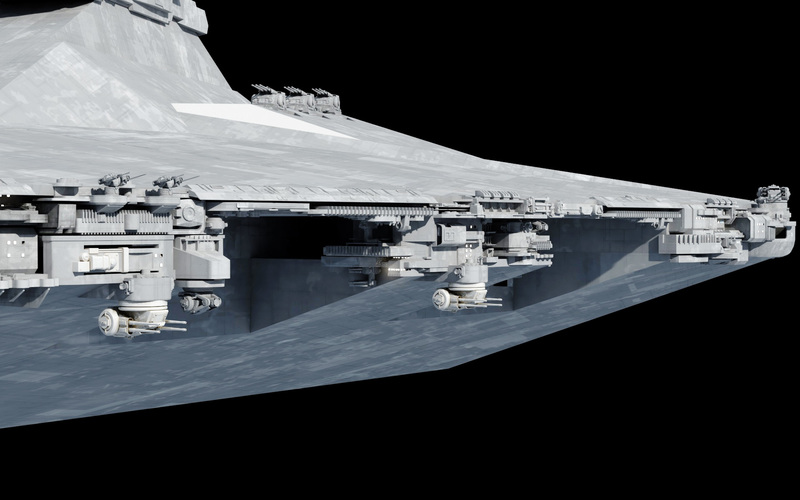 Maybe it could be the Centax Heavy Frigate which is mentioned in the books but never depicted? Just a thought. Take it for what you will. I like the look of the thing already though! Nice to see you brought back the heavy frigate Fractal but in the same detail as the Imperator redux that is just even better than I though. Sweet, the Acclamator’s pricklier sibling takes a couple steps closer to launch-and with a familiar hangar layout from some now-Legendized Dark Horse material. It’s been a while since I’ve seen this hull. I can’t wait to see how it turns out.